ENSENADA, Baja California, Mexico — Detailed coverage in text, images and video from this month’s 2018 SCORE Awards Night, including breakouts with overall point champions Wayne Matlock, Rob MacCachren, Todd Winslow/Matt Winslow and Justin Morgan/Mark Samuels are bathed in the spotlight this month in Vol. 5, No. 1 of the highly-acclaimed SCORE Journal digital online magazine. 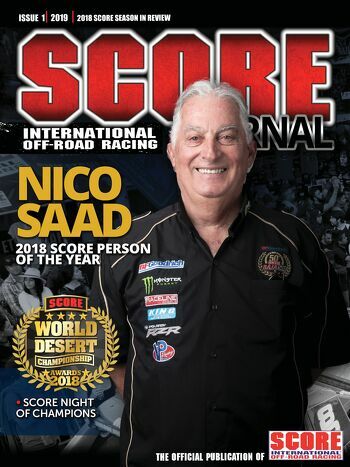 In addition to the in-depth review section of both the 2018 SCORE Award Night and each event in the four-race 2018 SCORE World Desert Championship along several colorful features and interviews, several SCORE News items, lots of new products and a very special feature on Nico Saad, the 2018 SCORE Person of the Year. The SCORE Journal digital magazine’s November 2018 (SCORE Baja 1000) issue delivered a record 2.8 million unique viewers/readers. The Spanish version of that SCORE Journal issue recorded 224,628 unique viewers/readers. The SCORE website for the week of the 51st SCORE Baja 1000 in November of last year had a very strong 1.2 million unique viewers. The newly produced live streaming format recorded 294,994 live views on race day during its debut at the 50th SCORE Baja 500 in June of last year. Vol. 5, No. 1 of the SCORE Journal is once again filled with numerous interesting worth-reading features, stories, captivating images, exciting videos and several news items. This edition is anchored around a very detailed look at the entire four-race 2018 SCORE World Desert Championship, overview and a detailed look at each event. Highlight of the edition is a large spread from the 2018 SCORE Awards Night, where nearly 600 racers, crews, sponsors, VIPs and media celebrated for the second straight year on Jan. 12 at the iconic San Diego Air & Space Museum. The photo and video-laden issue highlights the winning efforts of many, many racers topped by the stories on the championship efforts of Wayne Matlock, Rob MacCachren and the father/son team of Todd Winslow/Matt Winslow. There is also a wonderful story on Dan Chamlee, who won the Class 7 season point championship in his special Ford Ranger. It was his 14th SCORE season class point title and 13th straight. There is also photo package of all 32 SCORE Pro and Sportsman season point champions from the 2018 SCORE World Desert Championship. The Off-Road Marketplace in this issue continues to shine brightly on the latest new products for racers and enthusiasts. SCORE races in 2018 have been airing on the El Rey Network domestically and around the globe on ESPN International and syndication. The SCORE Baja 1000 will air as a two-hour special for race coverage and is scheduled to air first on February 24 of this year.